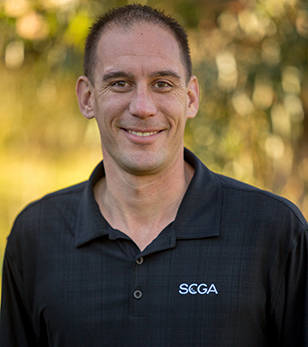 Matt has been an employee of the SCGA since 2004, starting with the Handicap & Membership Department and then transitioning into Course Rating and Rules & Competitions. He enjoys being a resource to the SCGA membership on any topic related to helping improve the understanding of the Rules, Tournaments or Course Rating and Measuring system. Matt is also a member of a Rules & Competitions Department that annually scores some of the highest marks in the country on the USGA Rules of Golf exam at the USGA/PGA Rules workshops. Matt has three kids: Kaeli, Connor and Madisyn. When he gets some down time, he loves relaxing at home with his family, barbequing and watching sports. What is your most memorable SCGA experience? "My most memorable tournament memory has to be from the 2011 SCGA Amateur Championship. The entire tournament had a buzz that was only matched by what you can feel at a PGA event. It was capped off by Patrick Cantlay winning the title in dramatic fashion in front of hundreds of cheering spectators. My favorite course rating memory is when I rated Torrey Pines before the 2008 U.S. Open. It was pretty special being able to be on the grounds one week prior to what turned out to be quite a remarkable tournament!" What is your favorite Rule of Golf? "My favorite Rule of Golf is “Rule 13 – Ball Played as it Lies." This encompasses everything that is great about the game. You make your own breaks. I say, if you don’t like the area you found yourself playing from, then don’t hit it there! If you happen to get a bad break, deal with it and move on!" Contact Matt Pawlak at: mpawlak@scga.org.